Jonathan Evison will be reading from West of Here this evening at the fantastic indie bookstore Skylight Books. If his reading is as raucous and fun as his previous appearance at Skylight for All About Lulu, this is an evening you really shouldn't miss if you're anywhere close to LA tonight. That sounds like a tall order, but, well. Swanky pub dinners have been cancelled for this. I might be overselling it. But you get my point. Jonathan Franzen will be reading tonight at The Aratani in Little Tokyo as part of the Aloud LA reading series put on by our fantastic Library Foundation of Los Angeles. I will be going to this event, despite the cries heard round the world (my shrill voice included) about being all Franzened-out. I am still all-Franzened out and I've not even read Freedom yet. It strikes me as rather convenient that this event takes place only steps away from both my house and an excellent, somewhat-secret alley bar and who am I to look that kind of serendipity in the face and not jump along for the ride? More to the point, it gives me a chance to get back to one of my favorite activities: writing elaborately long posts about the bizarre behavior exhibited at "important" readings in LA. Hopefully the Angelenos in attendance will not disappoint and I'll have some juicy tidbits to share with you all in the coming days. I've not yet begun David Mitchell's The Thousand Autumns of Jacob de Zoet because, frankly, I'm worried I won't like it. I've liked everything Mitchell has ever written (and that's not just because I'm a crazy Mitchell fangirl), but I've also liked everything Vendela Vida has ever written. Until now. Which is why I'm worried about Mitchell's latest. I wanted to love The Lovers in the way that I loved Let the Northern Lights Erase Your Name. But I didn't love The Lovers. I didn't even like it. There were a few sections where I was into the world Vida created, rooting for the characters. So there's that. Yet upon finishing the book I thought, so what? What was the point of all this? I felt nothing but a vague sense of how many ways this book could have been amazing and wasn't. What also nearly broke my heart was that the gorgeously taut language and precision-prose I've come to love Vida for were nearly absent from this book. You know me. I rarely write about books I don't like because, what's the point? There are plenty of people paid terrible wages that are happy to slam book after book. It's not really my ilk and as goody two-shoes as it seems, I'd rather focus my time (and your attention) on books that I loved because every book and every good writer needs as much love as they can get in these tumultuous-for-books times. So why am I bashing a not-liked book of a much-loved writer? Because it got me thinking. We all have books we wanted to love but didn't. We all follow every move of much-loved writers even though their last book (or three) left us wanting, confused, or just plain meh. What is that book for you? That book you wanted so much to love but with every page began to realize you weren't loving it and were, perhaps, hating it? Here's to hoping that The Thousand Autumns of Jacob de Zoet isn't another one of those for me. 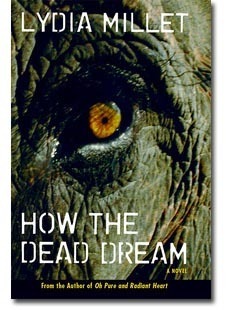 Over at LA Weekly, Marc Weingarten takes a peek at Lydia Millet's latest, How the Dead Dream. I uber-loved Oh Pure and Radiant Heart and I've had my eye on this novel as a must-read for 2008. "If Lydia Millet played by the normal rules of social satire, she might have been as large as T.C. Boyle by now. But whereas most satirists are looking for laughs much of the time, regardless of how sharp their knives might be, Millet is more the whimsical polemicist. Her novels are fanciful and surreal; rather than gently nudging everyday life into the realm of fluffy absurdity, she's trying to knock reality upside the head, thus revealing our venal and craven natures to ourselves." The Book, The People, The People of the Book, The People In the Book, The Book About People, The Book About Other People, The Other Book About People. Am I the only one who has been confused for weeks (weeks!) about these two books, thinking, strangely, they were one in the same? 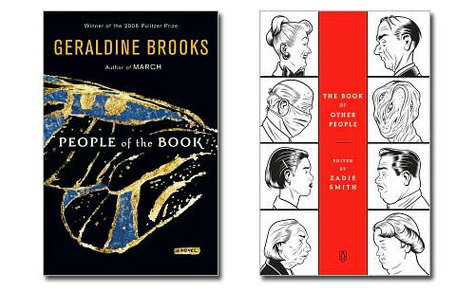 I seriously could not sort out how Zadie Smith had hooked up with Geraldine Brooks for what some were calling an intense re-retelling of the Haggadah and what others were calling a hilarious read on character. Richard Nash has written the most exciting post I've read in a long time. Buried within it are these words: "a new Donald Barthelme collection Flying to America..."
This brilliance, among other tasty news about forthcoming books from Counterpoint/Soft Skull/Shoemaker & Hoard, is worthy of many look-sees. I've bookmarked all catalogues and will return with my "oh my goodness I can't wait to get my hands on these" books list in short order. Proust may be kicked to the curb after all. "Day Three: I'm on the train home from work and taking a detour to Books Etc. when I see someone reading the book. It’s an epiphany. I want to kiss the man but I’m afraid it would distract him from his reading. So I sort of sidle over and have a look what page he’s on. I don’t recognize it. It’s not the book. It just has a similar cover. I feel a sudden fierce hatred for the man: traitor, cuckold. I close my eyes and picture him boiled. Books Etc. has lots of copies, which is good, unless this means they haven’t sold any, which is worrying. I inspect the racks. The book is in a good position in the buy-one-get-one-half-price promotion right at the front. But I’m not sure about the promotion. Do I want my book mixing with these others? What if someone buys mine, gets someone else’s half-price and prefers theirs? What then? I don’t know what then. I buy one and get another one half price. The man looks surprised that I want the same book twice and has to check that the promotion works like that. But I’m firm. I’m certainly not buying anybody else’s book. And I realize that’s what it means to publish a book: there’s a part of me over there on the shelves, and in Blackwell’s earlier today when a man took a copy down, rifled through it, and then, dismissively, returned it, I wanted to walk over and ask what the hell he was up to. Could he not see that he was touching a part of someone’s soul? Walk softly, I wanted to say, for you walk on my profits." A very good - and I suspect painfully true - read. Must now also check out his book as the funny factor in this piece is enough to make me want to read The Swap cover to cover pronto. Perhaps all the positive "reviews" have clouded my judgment. Any of you just-published authors engaged in this sort of "reorganizing the shelves" and "leaving copies behind to enhance word of mouth" tomfoolery recently?